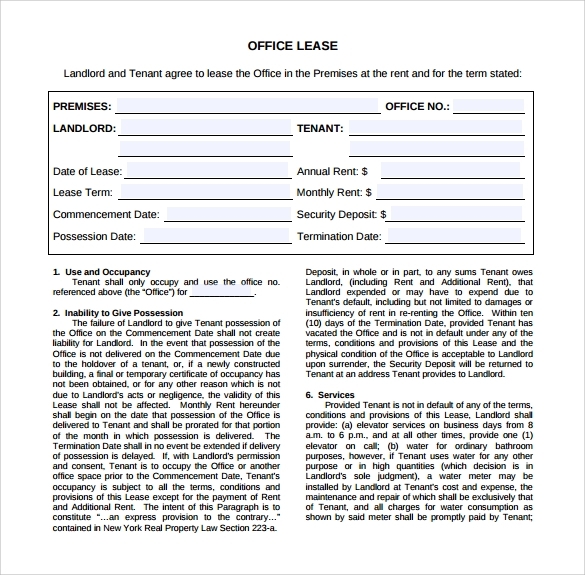 Office Lease agreement templates come into use when you have to legally lease out an office space that is not in use. The leasing out procedure requires various legal formalities that must be completed before the space for rental purposes. 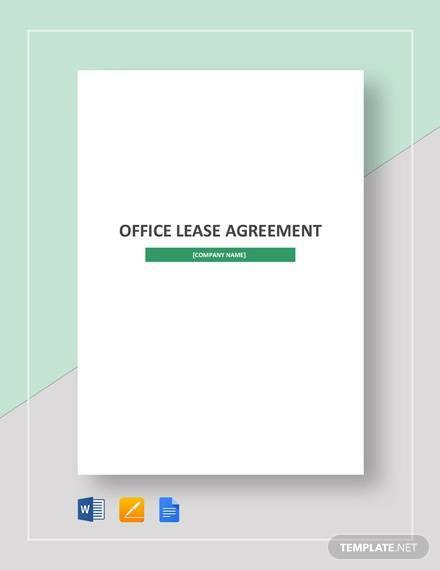 These Office lease agreement templates and Business Lease Agreement Templates let you bind all the legal formalities at one place and complete the leasing out procedure in a professional and non-risky manner. The office lease agreement templates have been written by expert technical writers to provide you the perfect format for writing a lease agreement of your office space. These templates can easily be printed and bring to use. The template is formal in language and format. It covers all important details required when making a lease agreement. 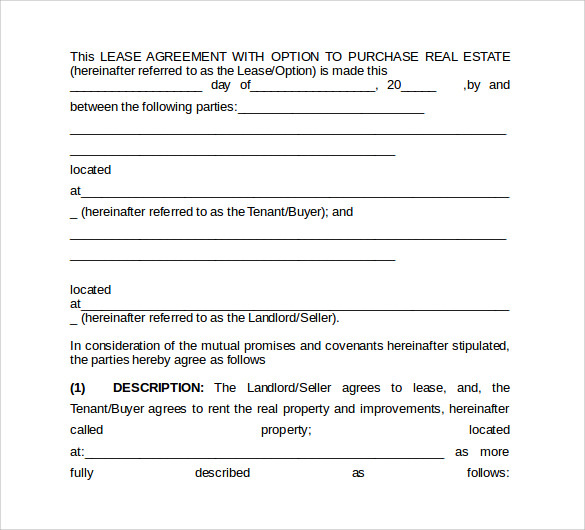 This is a simple lease agreement template that is easy to download and edit according to your needs. The printable office lease agreement covers all aspects of a lease agreement for effective communication between the involved parties. 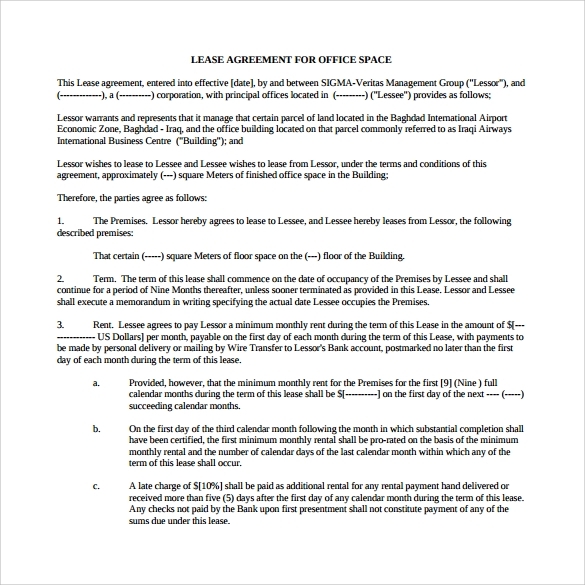 The template is a perfect example of a professional office lease agreement. 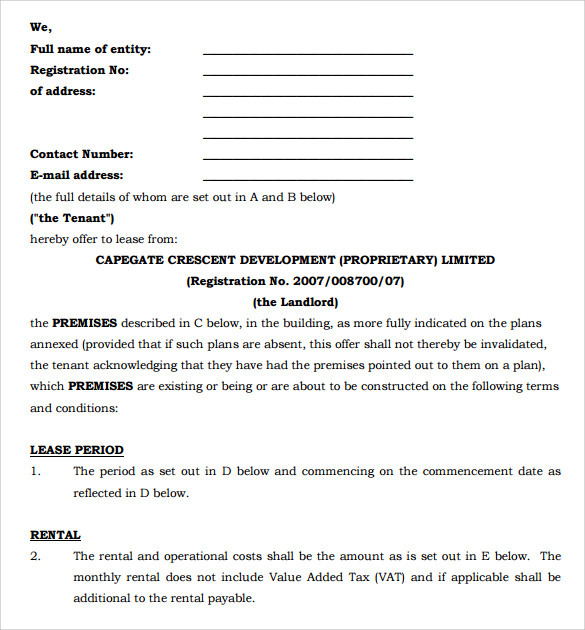 The example of office lease agreement cover intricate details like name of entity, registration no., address, contact information, lease period details, rental details etc. The example of office lease agreement can be downloaded and later filled with the details of the office space you wish to lease out. 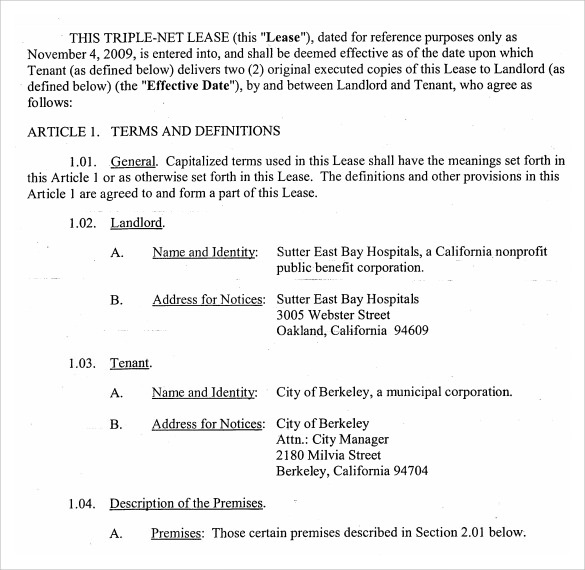 As the name suggests this is downloadable commercial lease agreement template word format. The format covers important lease agreement details which can also be tailored to your needs once downloaded. The format is professional in language and has clear statement of details of the property to be leased. 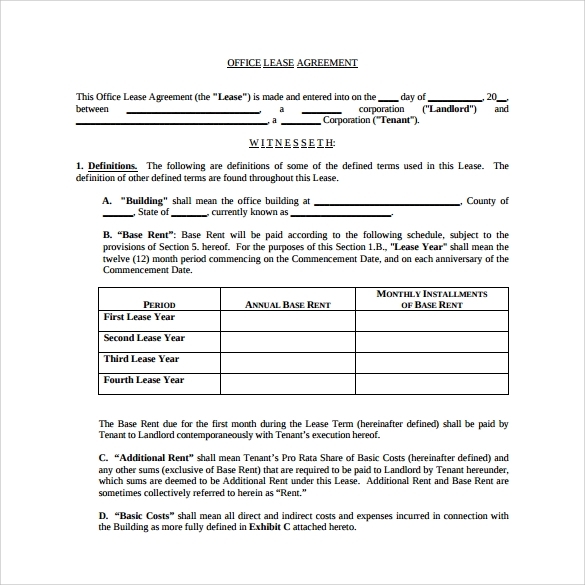 This is simple yet effective template for a non-risky lease agreement. 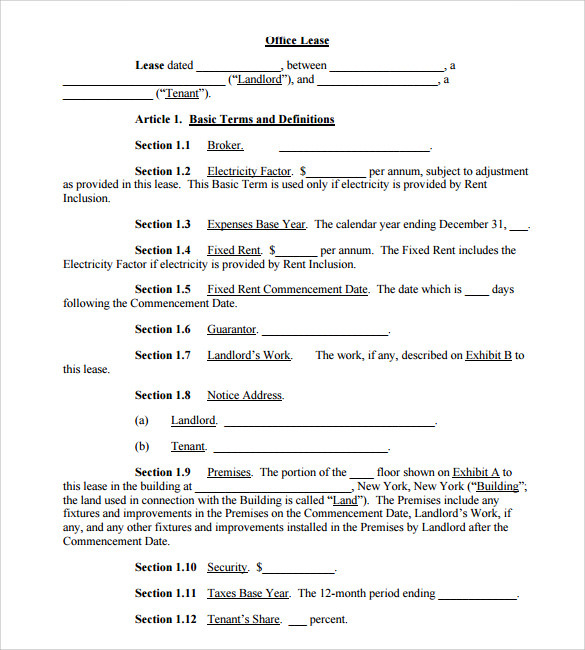 This is PDF format office lease agreement. The lease agreement covers every minute legal detail for a hassle free lease agreement between the owner and the renter. The template has been written by experts to establish a powerful contract between the two parties. The PDF format can be downloaded and edited to meet your requirements. Office Lease agreement serve the core purposes of providing you a professional and formal format of writing a lease agreement. These agreements are needed when you are leasing out an office property to someone on legal terms and conditions. 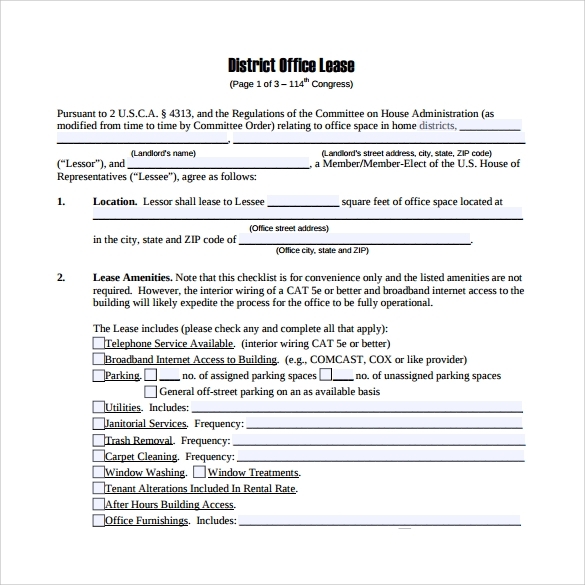 These commercial lease agreement templates cover every intricate detail that is important while writing a lease agreement. The templates are designed to bind legal formalities at one place so that there is clear communication between the owner and the renter. These Commercial Lease Agreement Templates have been written by professionals to build up a strong contract when leasing out an office property. One can choose from wide range of lease agreement templates available online and download the one that suits their requirement in best possible way. The office lease agreement templates are required by anyone who wishes to lease out their office space to someone on legal terms and conditions. The person leasing out the property require these templates to cover all important legal formalities of leasing out property. The Property Lease Agreement Templates are precise yet impactful to generate an effective contract between the two parties for clear communication of terms and conditions. The templates have been written by expert and skilled writers to meet the professionalism required in writing a legal lease agreement template. The free commercial lease agreement template is available online and can be downloaded and edited according to your requirements. 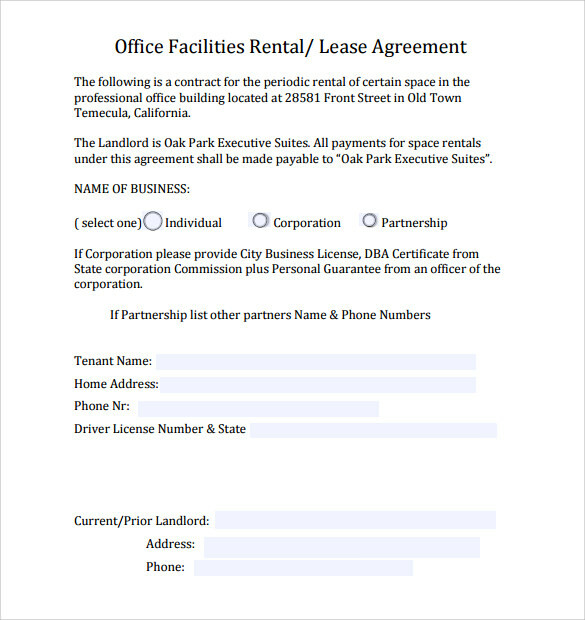 The best part about using office lease agreement template is that you can download them for free in popular formats like Word and PDF then you can edit the template to add or delete any text according to your requirement. The templates are one stop solution for a legal, professional and non-risky office lease agreement. Written by skilled and expert writers these templates cover all legal details that are important for writing an office lease agreement. Be it land lease agreement template, asset lease agreement template, vehicle lease agreement template or any such legal agreement template, all are available for free download online. Office lease agreement templates are best used by people who wish to lease out their unused office space in a legal and professional manner. These simple lease agreement templates can be downloaded in various formats like Word, PDF etc and can edited to meet your contract requirements. These are professionally written templates for carrying out a risk free leasing of the property.